Belina's Adventures: Ah... Birria, what a lovely thought! Ah... Birria, what a lovely thought! 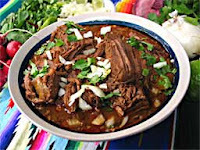 Birria - Is known as a spicy (or not) meat stew usually made from goat, lamb or mutton. A good Birria recipe is worth it's weight in gold, judging from the many followers of this much beloved dish which has regional representations all over Mexico. A festive occasion dish for the most part, since people make a big deal out of it's preparation - if you try to reproduce the old style of Birria which needs a deep pit, rocks, hours and hours.... yet, most restaurants or "birrierias" as they're called, do it stove-top and still do a BIG business. There's also a traditional method involving a clay oven in which you use a large "cazuela" and the meat gets covered. The cover gets sealed with "masa" and it's placed in the oven to slow cook overnight..... mighty fine. When we first moved to Puerto Vallarta, a coastal resort in THE birria state of Jalisco, I thought Birria would be plentiful and we would have our pick of places to eat this tasty d ish; but I found that not only was I mistaken about the availability but I was also dead wrong on the quality part. The only thing I found were street karts (don't get me wrong, I love dives, karts and all street foods and have eaten in pretty risky places all over the world - some have been heavenly while others where almost deadly, lol) BUT, in Vallarta as it's called by locals, there were no established restaurants at that time (long ago) and what there was served pork or beef birria (common thought is since it's a heavy sauce, it will disguise almost anything- but mediocre).... so, I decided to make my own. (This was one of the reasons for the birth of my first restaurant there- to eat what we couldn't find... I also thought there would be a lot of competition with "real" Mexican food, Jalisco being the heart of Mexico, but no one likes to cook there either....) Now there are chain "Birrierias" where you can find it which are ok and Mexican restaurants have gotten better too (and fancier). Guanajuato is also known for it's birria but this is served differently from the Jalisco version which is a soupy stew, topped with cabbage, onions, cilantro, radishes and crushed chile and of course, fresh tortillas. YUM! Guanajuato's version is served by separating the meat from the broth (called "consome") and the consome served on the side. Birria is made using a base of dried roasted peppers. 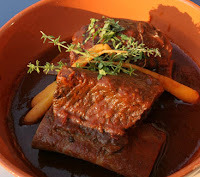 This gives birria both its characteristic savoriness as well as its remarkable variety, as different cooks will choose different peppers to use for the broth base. 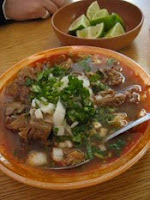 Birria is served by combining a bowl of broth with freshly chopped roasted meat of the customer's choice. One eats it by filling a corn tortilla with meat, onions and cilantro, seasoning with fresh squeezed lime juice, and then dipping it into the broth before eating it. The broth itself is also eaten with a spoon from the bowl or drinking it by the cup full. I've also heard other meats being used in birria like Iguana (where they are plentiful), Chicken, Turkey and anything else you can think of really. If you like, substitute chicken for the meat in this recipe- just remember chicken is tender meat and doesn't need as much cook time, so keep an eye on it, ok? It works really well and my family likes it too. I never had the space or time to go "all out" and make pit Birria (or barbacoa either) yet our offerings never suffered from this as the birria was always a popular request at all my restaurants and is still a family favorite. Just came back from the Mexican market and everyone asked me to make birria after seeing all the dried chilies and spices available. I agree! BIRRIA ESTILO JALISCO.- Ajua!..... There are so many variations to this recipe yet this is a wonderful one, easy to make and gives terrific results. To begin you place the dried chiles and sesame seeds in a dry pan and roast everything for 4-5 min or until fragrant. Don't burn and keep turning, chiles should get soft. Put the dried chiles in a pan with hot water and allow to simmer 10-15min so they will get softer still. If you're using fresh herbs instead of dried, you might want to toast them gently too. Roast the tomatoes, onions and garlic in a pan with a little oil or lard and get them charred. Put the meat into a large vessel (roasting pan if you will be cooking in the oven) and cover really well with the sauce and allow to marinate overnight, cover, refrigerate. If you're using a pressure cooker, put in tupperware or large zip lock bags and refrigerate too. When you're ready to cook: If oven roasting then place in a pre-heated 375 F and cook, covered, until tender. When it's almost done (test by grabbing a rib, if almost falling off the bone it's done), (test after 1 hour and keep checking) uncover and allow to get a nice crust for the last 30 min. If you're using a pressure cooker, then put it all into your pot and cover. Once it begins to "sing" (the valve starts to hiss), turn down the heat and give it 30 min. Allow the temperature to come down so you can open the pot, the meat should be tender - if not, cover again and cook for another 15-20 min. When you're meat is tender, separate it from the sauce in the pan and cut into small, edible pieces, cover with aluminum foil and set aside to rest while you finish the broth. You now have a thick sauce left; put in a large pot and bring to a slow boil (also depends how fatty your meat was, if you want it "lighter", then allow the sauce to cool first, remove as much fat as you like, then bring to a boil). You can now add the chicken stock. I would begin by adding a cup at a time until your result is a med consistency you can eat like a soup. Depending on your taste, you can make it thicker or thinner. Taste and adjust seasonings, should be served hot. Place some of the meat in a bowl with some of the broth. 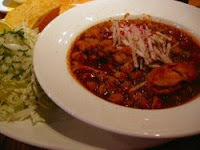 Toppings are served on a separate dish so everyone can add what they like ei ther as a stew or tacos. Enjoy!